Can you know for certain God hears your prayers? Do you sometimes wonder if God hears - let alone answers - your prayers? Do you ask yourself, What's the point of praying? Do you long to experience the power of prayer in your daily life? 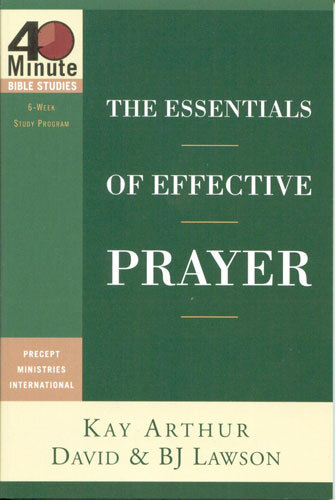 Find the keys to an effective prayer life in this compelling study that explores both God's expectations of you and His promises to you when it comes to prayer. Through a detailed examination of the Lord's Prayer and other examples of prayer throughout the Bible, you'll discover a model for talking with God. 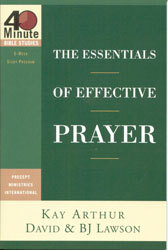 You'll also learn key principles of prayer and gain a deeper understanding of how prayer can draw you closer to His heart. 40-Minute Bible Studies: Discover the Truth for yourself in Short, Easy Lessons. This Bible-study series from beloved teacher Kay Arthur and the teaching staff of Precept Ministries tackles important isssues in brief, easy-to-grasp lessons you can use personally or for small-group discussion. Each book in the series includes six 40-minute studies designed to draw you into God's Word through basic inductive Bible study. With no homework required, everyone in the group can work through the lesson together at the same time.l Let these respected Bible teachers lead you in a study that will transform your thinking a- and your life.